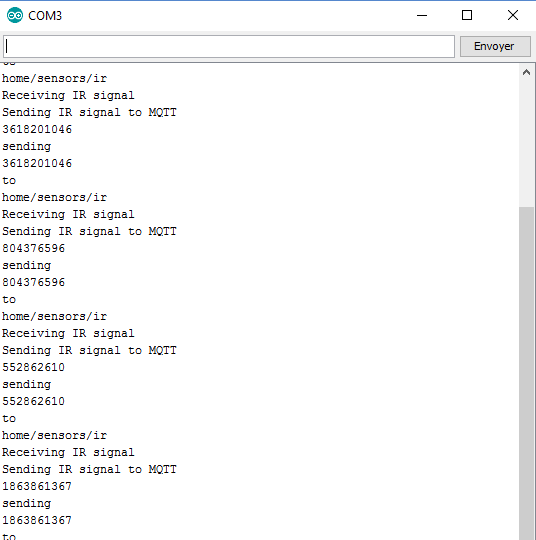 Following discussions on the home assistant forum people gave me the idea to add Infrared communication to the 433mhz gateway. It can be an interesting part in an home automation system so as to interface sensors and actuators (wall sockets), your tv, home cinema, hifi ... with software like openhab or home assistant. 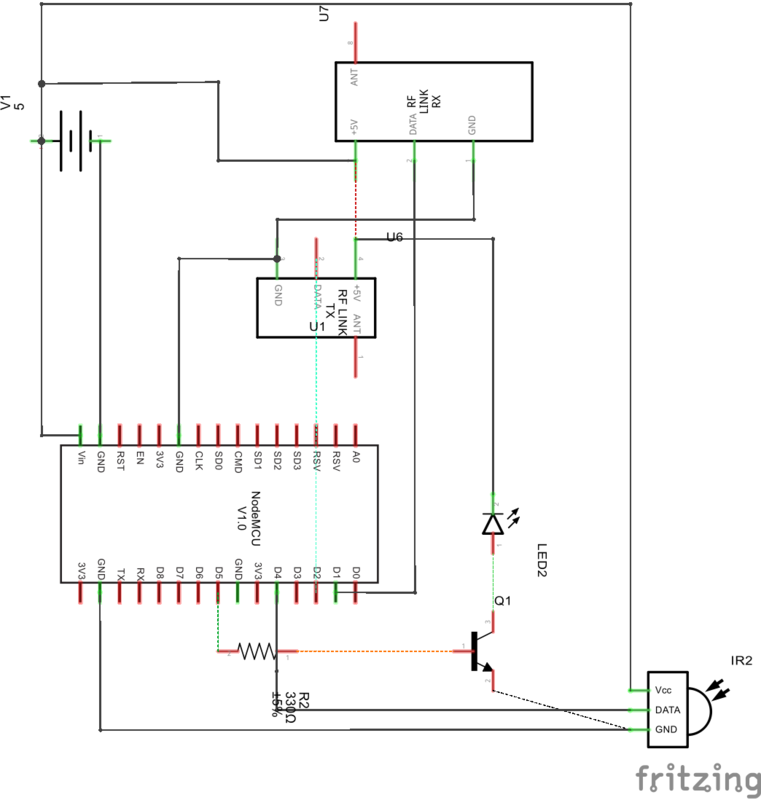 If you want to increase the range of the receiver XD RF 5V plug its vcc directly to a 5V power supply like on the schema below and not to Vin of your nodemcu, it will considerably increase the range. 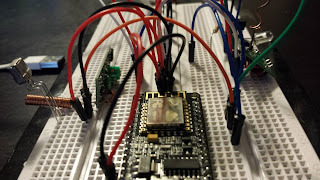 In this case I disconnect the usb cable as I don't know if the nodemcu can handle the both source of power. Install Mosquitto to your server. 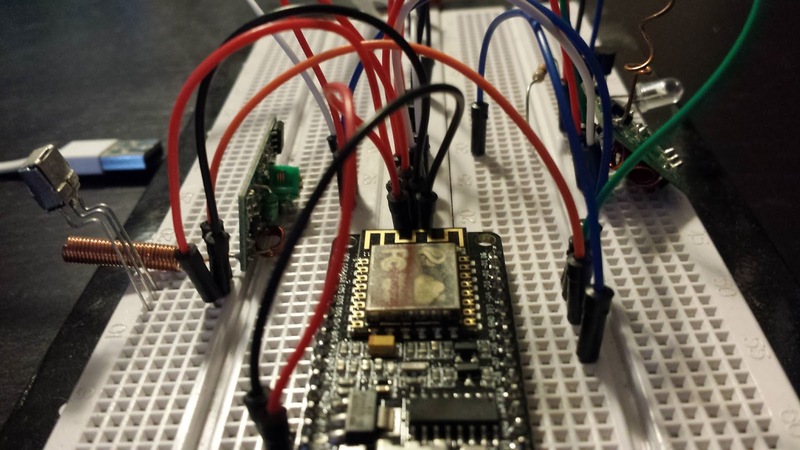 Upload the sketch to your ESP8266 and open the serial monitor with a speed set to 9600b. 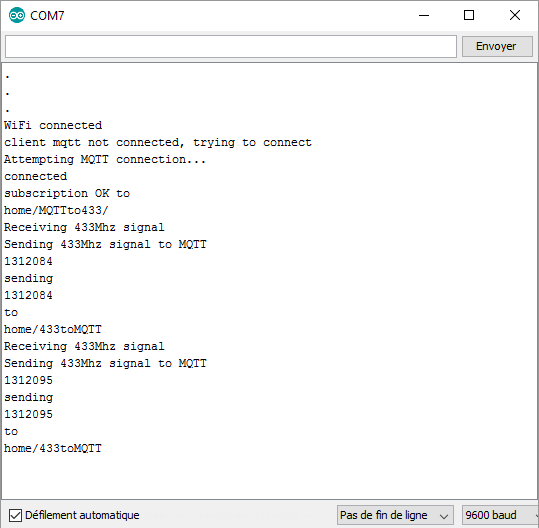 If the connexion to mosquitto is ok you should see on the serial monitor of the arduino "connected" & "subscription OK to home/commands/#"
The code after the -m represent the value you want to send. 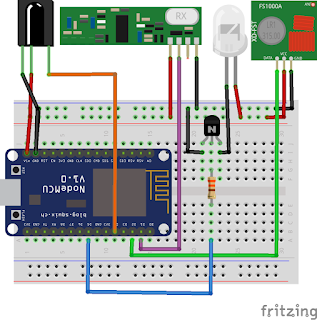 As listed there all that you really need as far as hardware components goes is a ESP8266 or ESP32 chip, InfraRed and 315 or 433 MHz transmitters, and InfraRed and 315 or 433 MHz receivers. The source code for protocols and more could be copied from other firmware project (and shared with that project) as long as you keep it open source under the same license. Regardless it would be a good idea to make the whole firmware open source as then you have the possibility of getting help with the code from the community, and open source projects also often get more passionate communities than those who keep their code proprietary and closed. Great project. 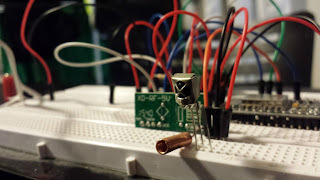 I was wondering if the output of the IR receiver and the Rf receiver is not too high for the esp chip when those modules are supplied to 5Volt. Thanks, in theory yes esp8266 accept 3,3V and the receivers are returning 5V signal, but in real life it works and I never had issue about this. This picture shows pin D1 and D2. 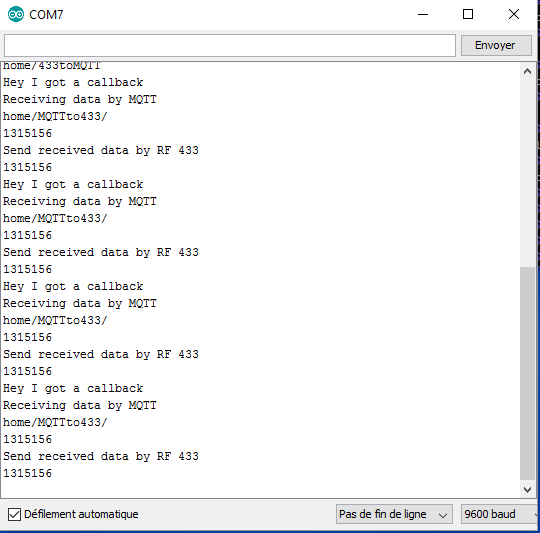 Based on the code for ESP8266, it seems like I should use D3 and RX? So far I cannot receive any signal. I also am not sure to convert the binary based code to the decimal base code to verify the transmit works. 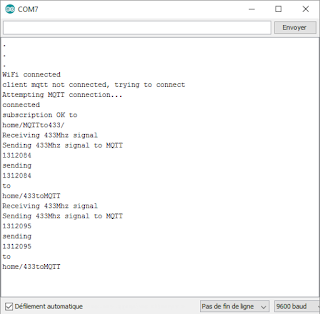 Wifi, subscription to MQTT, is working. I disabled IR in my code. It can be an interesting part in an home automation system so as to interface sensors and actuators (wall sockets) with software like openhab. 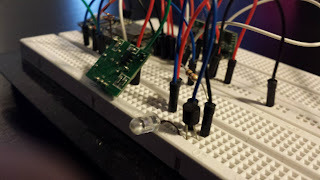 The interest of putting this gateway to an ESP8266 and not on a raspberry pi is to be able to manage security actions at gateway level (power on a siren, cut power to certain devices) following RF data received by sensors without being dependent to the PI for security related actions. With the add of SONOFF RF Bridge to the OpenMQTTGateway compatibility list we were able to send and receive 433mhz by MQTT. 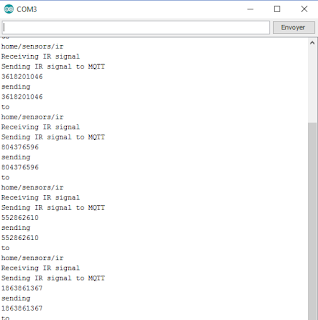 The interesting thing with OpenMQTTGateway is the ability to have on one board several gateways (RF, IR, BLE and more to come ;-). The last versions of SONOFF RF BRIDGE as two IO free pins, why not using these pins to add a new gateway to this little cheap device and control more devices. If we follow the interest of the different gateways you are more interested on RF and after comes IR infrared. 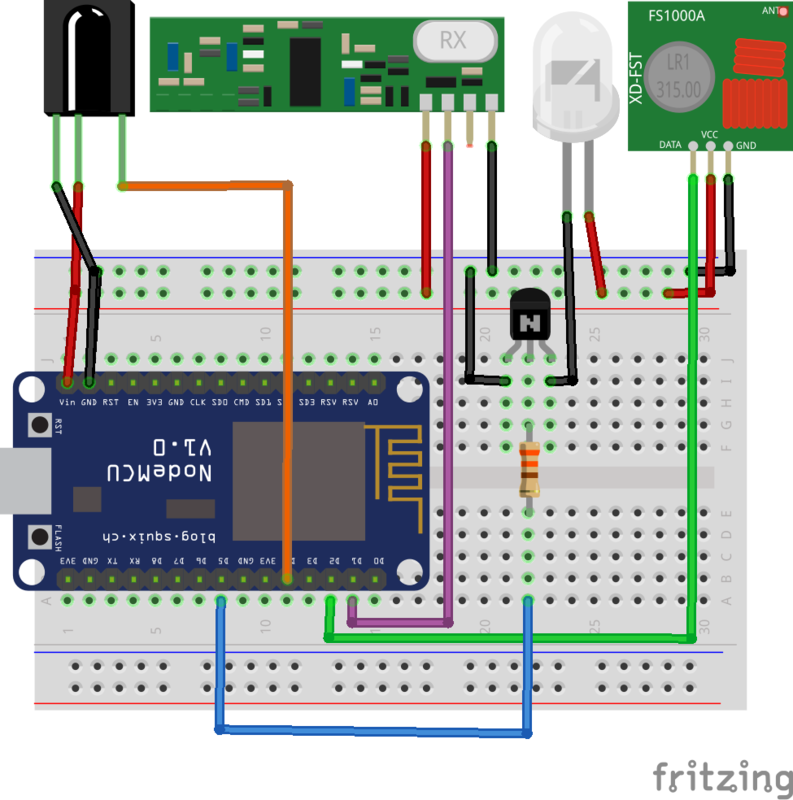 On the hardware side, I followed the same schematic for IR setup with ESP8266 with just a little add a protection resistor of 1K for the IR led. 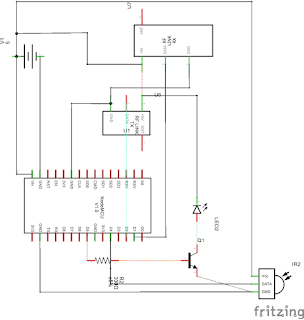 The other resistor is connected between the transistor base and IO5 of the RF Bridge instead of D0. 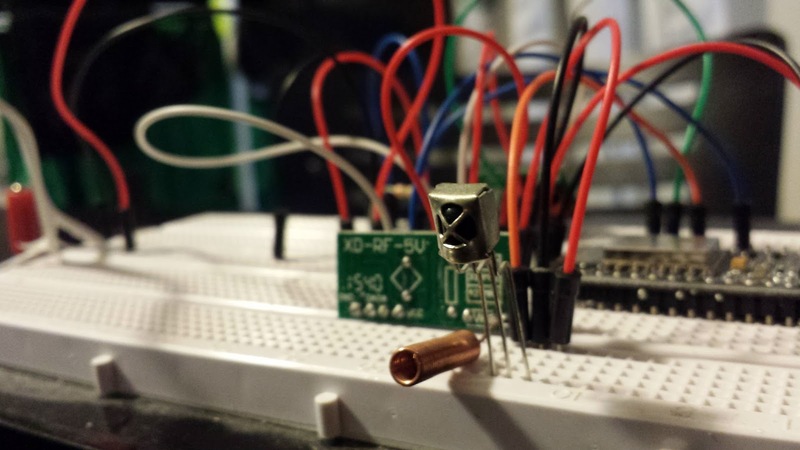 The IR led is powered by the 3,3V of the Sonoff RF Bridge. The material and information contained in this blog is for general information purposes only. You should not rely upon the material or information on this blog as a basis for making any business, legal or any other decisions. There is no warranty given on this blog content. If you decide to follow the informations and materials given it is at your own risk. I will not be liable for any false, inaccurate, inappropriate or incomplete information presented on this blog.